Exodus wallet is a multi-cryptocurrency wallet, which means you can use it to store multiple types of cryptocurrencies (pretty self-explanatory). Its popularity is mostly due to the fact that it supports top cryptocurrency assets, such as Ethereum, Litecoin, Dash and Dogecoin, and of course, Bitcoin and Bitcoin Gold. It is rumoured, however, that the wallet will soon be able to support Factoids, an interesting project by Factom. In short, it’s an autonomously distributed protocol for separating Bitcoin’s blockchain from the cryptocurrency itself. But that’s a whole other story. Back to our Exodus wallet review, the first thing we want to address is its biggest strength, its carefully designed GUI. Read on and learn all about it. So, this is a platform for managing and exchanging your blockchain-powered wealth in a secure place that’s at the same time beautifully designed which simplifies its use significantly. Launched in July 2016, this desktop wallet stands out precisely due to its design, which is focused on both ease of use and being able to have complete control over your assets. More specifically, it’s designed to allow complete control over a complex portfolio, but at the same time, it’s the perfect choice for those who have zero experience with an exchange. Ambitious, right? When choosing a wallet, you should pick a reliable one and base your decision on several factors. Some of those should include ease of use, operating systems compatibility, private keys control, wallet’s development community, and backup and security features. This goes for both software and hardware wallets. Exodus was created in 2015 by JP Richardson and Daniel Castagnoli, both of whom have impressive CVs – Richardson has published almost 250 open-source libraries and his code is being used by most of the cryptocurrency software, including Bitcoin. Castagnoli has worked with names such as Apple and Nike, and he is responsible for the wallets famous design. The company’s user experience focus is already obvious simply by taking a look at Exodus.io. Basically, Exodus wallet combines great design and engineering into something that makes crypto fun even for those without a technical background. Never used an exchange before? This product does everything for you, without bothering you with complex details of, say, exchanging Bitcoin for Litecoin. You will rarely need assistance, but there are a number of tutorials available, as well as a 24/7 online support help desk. The wallet is currently desktop only, and it’s available for Windows (64bit), Mac and Linux. We should also say that Exodus app is designed in a way that makes it simple to download, install and use, but it is far from the only plus side the wallet has. Not by a long shot. More on other advantages in the rest of this Exodus wallet review. 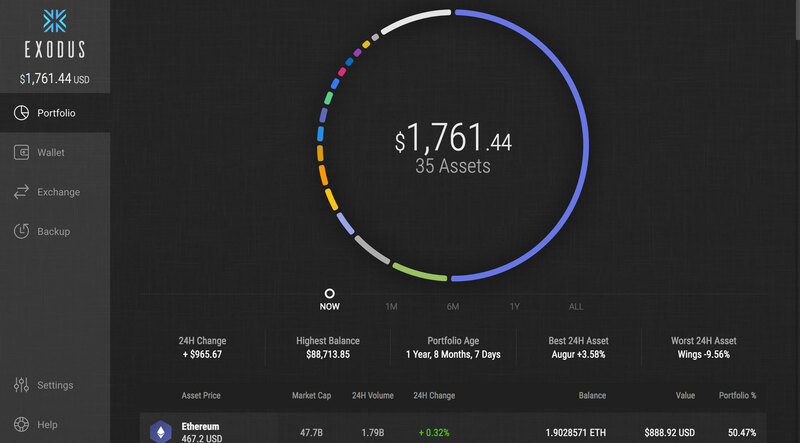 Apart from those already mentioned in the introduction, the wallet supports a number of blockchain assets, including Golem, Augur, Aragon, Basic Attention Token (BAT), Bancor, Civic, Decred, District0x, EOS, Ethereum Classic, Edgeless, FirstBlood, FunFair, Gnosis, OmiseGo, Qtum (ERC20), iExec RLC, Matchpool, Numeraire, Status, WeTrust, Wings and SALT. You can keep all of these in one place and at the same time organize your savings with a live pie chart portfolio. One of the best features is the Exodus wallet built-in-exchange. This feature allows instant trading coins between themselves and goes by the name of ShapeShift. It is the first desktop multi-asset wallet fully integrated with ShapeShift. What does this mean? As a user, the only thing you need to know how to do is to choose the amount you want to exchange, while all of the technical details are already automated, behind the scenes. Your desired assets are then sent to ShapeShift, their exchange partner, who will in turn process your deposit and send you the converted assets. You can see a visual representation of this process and track its progress in your Exodus app, in the form of a spinning activity circle. You can choose to view the details about the specific exchange, such as transaction ID, exchange rate and Shapeshift exchange order ID. Exodus fees are, of course, charged for every processed payment – this is what a service provider does. However, the fees are never kept by the company – instead, they are paid to each blockchain network. Exodus fees are adjusted depending on the changes in the blockchain, therefore they cannot be set manually. The wallet makes money by taking a smaller portion of the major asset exchange spread, ranging typically between 1-3%. Exodus bitcoin fees, however, can get somewhat larger, depending on the currency itself, since there is no option to choose a smaller transaction fee. The company’s strategy in terms of transactions is focused more on speed and reliability than it is on providing cheaper service. How can you see the network fee for bitcoin transactions? Just try to send an amount of bitcoin without actually clicking the send button, and your Exodus fee will pop up immediately. Regarding key control, the wallet handles private key and transaction data encryption locally, so your personal data can remain private. Therefore, the company doesn’t hold your assets, like in a classic stock portfolio. You are in total control of your assets through a set of private keys. Those are generated when you open a wallet for the first time and they are the most important part of controlling your assets. The Exodus wallet is software that runs locally, on your device, without any interaction with the company’s servers, so the private keys are generated and held offline. Wondering how transactions are made possible? Well, something called Insight Servers come into play, and those are controlled by various companies and don’t include Exodus. 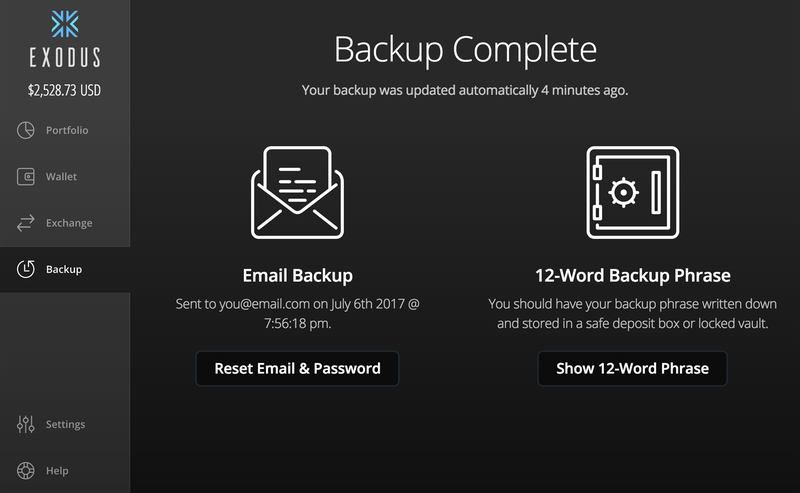 The history of your transactions is encrypted and backed up, so the company never knows how much money you currently hold. Since Exodus wallet has no hosted servers or logs, you can store your coins without any worries. Your only job is to keep your private keys secure and never give them to an untrustworthy partner. But there is another version of this product you can use! 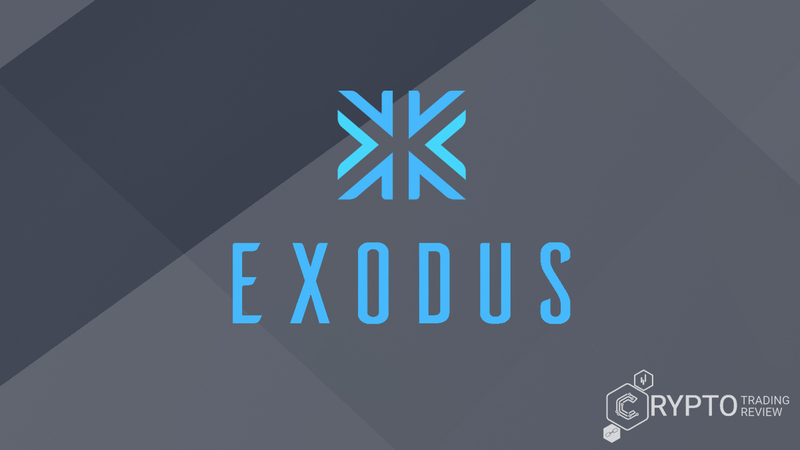 Stay with this Exodus wallet review to learn all about it. Exodus wallet’s strict quality standards mean that some of the newest assets on the crypto market take longer to deploy, which means that those early-adopters – the users that want to explore new assets as soon as they appear on the market – need to wait a little longer. This problem was solved by launching a special version of the wallet, designed specifically for users who are ready to rely less on official support and roll up their own sleeves in the process. 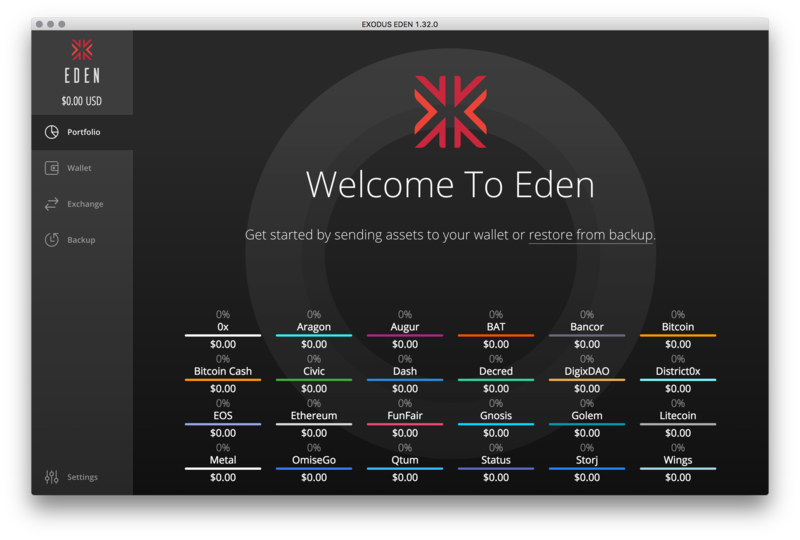 For more advanced users, this wallet has an advanced version – Exodus Eden. It’s still in its pre-release phase, so it is unsupported, but you’ll still be able to communicate with the team on Slack. It’s designed for even greater control over your assets, with more features and options than the official version. You can run both versions side by side and exchange between them, on the same computer. This cutting-edge release is for advanced users only since the support is provided exclusively by the community on their public Slack channel. With advanced trading options, Eden provides support for ERC20 tokens, Ethereum Classic, Factom and Bitcoin Cash, unlike the official version, and they are very much independent projects. As its name suggests, this product lets people leave the ‘geeky’ imagery related to blockchain technology and experience it in full. Its focus on design allows even the least technical savvy of users to exchange assets in a matter of seconds. For those who need it, there are many high-quality video tutorials on blockchain to choose from. One of those is, for example, a walk-through on how to use the Exodus app, which shows users their portfolio. Another tutorial demonstrates the built-in Shapeshift exchange, fully integrated into the wallet. It isn’t completely open-source, but many of its components are, and interested users can check out the source code on the company’s Github repo. If user experience and interface are very important to you, our Exodus wallet review has shown that this option is definitely the way to go. Its usability makes it a great choice for cryptocurrency beginners. 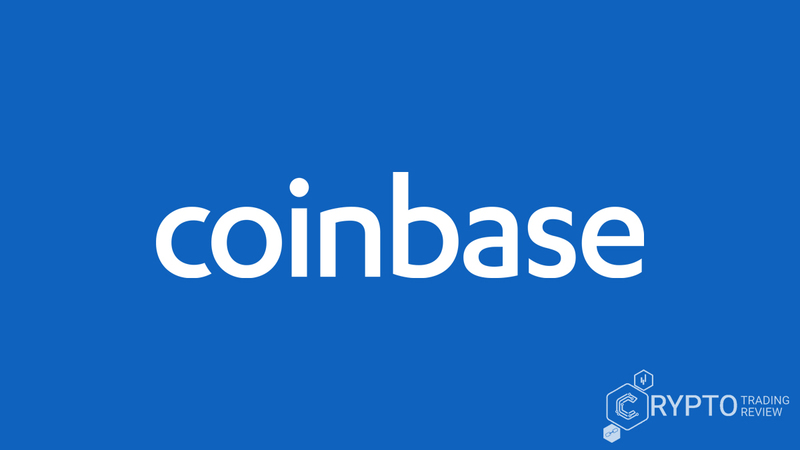 Like we said, it is used to store a whole host of coins, so you don’t need to get, for example, a separate Bitcoin and Litecoin wallet. Design-wise it is built very well, and it is a “hot wallet” – this means it is pretty secure and all of the information is stored on your computer. The founders make tutorials on how to use the wallet and are very active on Slack – you can join the Exodus Movement there. At the moment, this product is available for desktop only, but expanding to other platforms such as mobile is inevitable. The same goes for security options, such as hardware (secure key signing) and 2-factor-authentication. 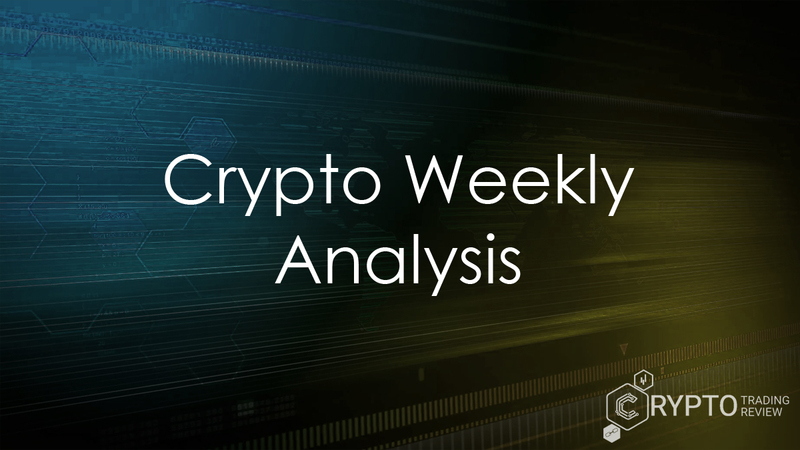 Seeing how the company plans on supporting several new altcoins in the future, as well as going mobile and possibly more open source, we can expect even more. Download the wallet now and you’ll never have to worry about which wallet to choose again.